Above, a technician performs specialty welding at medical equipment firm Angiodynamics in Manchester, Ga.
y all indications, <?xml:namespace prefix = st1 />Georgia's talent base is at the top of its game, higher education is a primary factor, and companies around the globe are paying close attention. "Rich talent is the key for NCR to grow its innovation hub," says Bill Nuti, chairman and CEO of NCR Corporation, which is creating some 2,100 new jobs in the state via a corporate headquarters move to the Atlanta suburb of Duluth, expansion of its services and training capabilities in Peachtree City, near Atlanta's Hartsfield-Jackson International Airport, and a new ATM manufacturing plant in Columbus. "Georgia is a state that is committed to attracting and retaining high-tech talent, and a strong work-force training program such as Quick Start is essential for our existing and future employees." It's not just companies; it's nations themselves who are noticing. In October, Ambassador Capricia Penavic Marshall, chief of protocol of the United States, led a group of 35 ambassadors to Atlanta (home to nearly 70 consulates and trade offices) for the first-ever stop in the Southeast by the federal government's "Experience America" program. "This is a strong testament to Atlanta's reputation as an international leader in business, logistics, education and research," said Georgia Gov. Sonny Perdue, just a few weeks after attending the grand opening of Sony Ericsson's new North American headquarters in Atlanta. "I expect this event to lead directly to closer diplomatic and economic ties for Georgia across the globe." Those ties are growing stronger already, thanks to such institutions as the Georgia Institute of Technology, where a focus on economic development has been part of the university's mission since its founding in 1885. A recent study by the Southern Growth Policies Board found Georgia Tech's economic development program to be the most comprehensive of any American university. "Most CEOs that I meet with are already very familiar with the reputation of our universities and they know that we can help companies not only with workers, but also R&D and ways to help them commercialize products," says Gov. Perdue in an interview. "Georgia's Centers of Innovation program, for instance, is housed in the Department of Economic Development, but each center is attached to a university in order to help connect those dots for a company and get to unique resources academic institutions bring to the table." Georgia Tech's Technology Square development, a mixed-use area near its main campus in downtown Atlanta, connects the dots by bringing them closer together. It's literally the home of economic development for the state, housing the Georgia Department of Economic Development, the legendary Quick Start customized job training program, and the University System of Georgia's Intellectual Capital Partnership Program, among others. 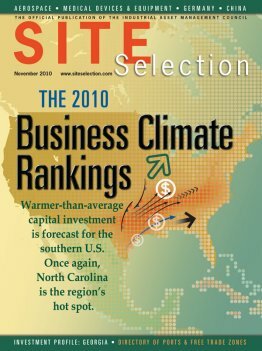 It's also home to Georgia Tech's Enterprise Innovation Institute, and to the economic development resources of Georgia Power, a Southern Company utility that is perennially among Site Selection's Top Utilities in Economic Development. "A good candidate for 'best of breed' can be found at Technology Square," said the Nelson A. Rockefeller Institute of Government in early 2010. "They're looking for people who can work in a team environment in problem solving," he says. "They're also looking for multicultural assets. Since a lot of companies we recruit are international, they are looking for a work force that is culturally sensitive and aware, and has specific skill sets in terms of language, and understanding business environments in other countries." Gant's team has analyzed both general and student populations in the region, and concluded that whether your company hails from Latin America, Asia or Europe, "you will be able to find workers who speak your language, understand your country and the U.S. economy." "The teams at our 10 international offices are well-equipped to introduce companies in their regions to Georgia's work force and other assets," he says. "We also ensure these companies know that we are deliberately cultivating an environment that not only educates and trains our workers, but that encourages them to stay in Georgia. Once people come here, they want to stay. That's the truth, and that's part of our message." Interest in Georgia is coming from companies based in emerging economies such as China, India and Brazil. A number of Chinese companies are already growing in Georgia, including construction equipment maker Sany America in Peachtree City and appliance maker Hisense with R&D and headquarters in Gwinnett County. Georgia Department of Economic Development Commissioner Heidi Green, who's visited seven countries in the past five months, says it's evident from a recent China trip that many more are interested, provided they get the support they need. "We formed an international team just to work with companies who'd never done FDI into the United States, because they need so much support," she says. "Certainly Chinese companies will be doing FDI into this country, and we're prepared to be of assistance to them, not just from a money standpoint, but for things like how permitting works and how taxation works." Programs such as the award-winning and much-imitated Quick Start pave the way for incoming firms. But Quick Start staff are just as likely to be on an outgoing flight, if that's what it takes to help the client. "Quick Start will send people all over the world to make sure we're capturing those best practices the company wants," says Green. NCR officials, for example, were astonished that Quick Start, with the ink still wet on the ATM plant agreement with Georgia, put people on a plane to the company's new facility in Hungary. "We've heard from international companies all over Georgia who've said they have taken those manuals and translated them, and used them at other locations," says Green. "It's hard to put a dollar amount on that." Masino and Gant both cite the Atlanta area's attractiveness to the "young and restless" types, between 25 and 35 years old, who are moving there from all over the Southeast and Midwest. "My wife and I were engaged to be married in 1994, had just graduated from The Ohio State University and had great degrees," testifies Masino. "We made a pros-and-cons list that included Chicago and Columbus, and there were way more pros to moving to Atlanta. Atlanta continues to grow, and it's continued since we've been here." "Although jobs are still important, they are no longer enough," says Kevin Stolarick, research director for the Martin Prosperity Institute at the University of Toronto. "People expect or require more than just a job if they are going to move to a region. Some people will move just because they like the region or because they feel they can make their own job once they are there ... People like thick labor markets — they want to go someplace where they know they will have multiple opportunities." That description helps make an equally compelling case for such gems as Savannah, home of institutions such as Gulfstream Aerospace and the Savannah College of Art & Design (SCAD). SCAD now has a campus presence in Atlanta, in addition to a new campus in Hong Kong. With the tagline "the university for creative careers," the school is known as much for its attention to redevelopment and preservation as for its cultivation of artistic talent. Metro Atlanta's Hans Gant says beyond his area's well-known schools such as Emory University, he'd point to the emerging presences of Georgia State University (downtown) and Kennesaw State University, along I-75 north of Atlanta. But SCAD's new campus has been "particularly important to us from the standpoint of digital content and media. The training and programs they have in those areas are very attractive to the companies we're trying to recruit in that space." Strong digital content and media programs are also in force at Georgia State, Kennesaw State and Gwinnett Tech in the Atlanta area, and at Georgia Southern University in Statesboro, among others. Back in Savannah, digital media is alive and well, and not only at SCAD. Witness last year's $5.5-million digital media production studio from Meddin Studios. The company took advantage of Georgia's 2008 Entertainment Industry Investment Act, which offers up to a 30 percent tax credit for qualified productions. "SEDA worked with The Creative Coast Alliance to support Meddin's start-up by introducing them to as many people and resources as we could – from potential clients to potential investors," said Lynn Pitts, senior vice president of the Savannah Economic Development Authority. "Savannah is eager to embrace and nurture these types of operations, and Meddin Studios will lead the way." Even the area's biggest industrial project has creative connections. Mitsubishi Power Systems Americas'Savannah Machinery Works project in Pooler expects to employ 90 by the end of 2010, 200 by the end of 2011 and ultimately 500 by 2016 in the manufacture of gas turbine combustors and components and, eventually, entire turbines to serve the power industry. Larry Brown, manager of human resources for Savannah Machinery Works, says his growing cadre of multi-skilled professionals includes a mechanical engineer out of Southern Polytechnic State University in Marietta near Atlanta; an advanced physics major from Morris Brown College in Atlanta who's part of the quality engineering group; and an industrial designer from SCAD. Just as impressive to Brown is the depth of experience he found among other welders, from exotic metals to programming welding robots. Progress on the project has been swift enough that the company gave the go-ahead for phase two of the project a full six months earlier than expected. "Quick Start did a tremendous job in helping us in the design of a welding evaluation process," says Brown, noting that the speed was even more dazzling for having unfolded between Thanksgiving 2009 and New Year's Day 2010. "We got with three different sourcing companies, and we estimate they went through 1,544 resumes to get us 193, culled down to 124, which we interviewed over 13 days to get to 34 to put through the welding evaluation to get to the first 20 we brought on board." He describes the core of his employee base as "welding surgeons" who work with machinery he calls "eye-popping" in its sophistication. But on reflection, he says, "The more I think about it, what's really neat is the human capital we have here, more than the capital equipment. The biggest challenge we had is there aren't a whole lot of places in the world that have ever built things like we're building. These are jobs that were sent out of the country 25 years ago that we're resurrecting here." A 37-year industry veteran, Brown has started up and turned around plants around the world. He calls Savannah one of the last bastions of Southern civility. Just as welcoming is the small city's depth of talent, intelligence and character, he says, identifying the people's work ethic and integrity as an ideal match for his company's culture. "When you consider that the Greater Savannah area has 132,000 people, we've been highly successful in finding the talent we need," he says. "I call it mining for diamonds." He says the behavioral questions that were part of the interview process for hourly workers were the same ones posed to executives, "and I've watched executives melt during them over the years. We have a work force that is fantastic, and the bulk of them are local." Brown says the partnership with Quick Start has included adaptive leadership, forklift, motivation and conflict resolution training, "and if they don't have it off the shelf, they design it for me. The State of Georgia may not realize the jewel they have in Quick Start. It is truly one of those things that, to me, is a differentiator. I had not worked with them before, and I have never been more impressed in my life." A recent slew of projects from German automotive supplier Moeller Tech (Elberton), King's Hawaiian bread company (Oakwood), TIMCO Aviation Services and First Quality (Macon) and Mage Solar (Dublin) are among the newest roster entries at Quick Start, where the resources often surprise even the most well-traveled corporate site evaluators, who may have a limited conception of what "work-force training" can encompass based on experiences in other states. Georgia Quick Start offers such tools as video-, computer- and Web-based modules, and its own studio and editing suite. It offers a range of services from pre-employment assessment to leadership, orientation, operations and productivity enhancement techniques such as kaizen, to courses on team building, communications and other soft skills -— skills much more in demand in an era of hybrid and virtual companies. In fact, Quick Start could be considered the starting blocks for nearly every prospect. Almost any project will have Quick Start brought up in the conversation, because of the active, hand-in-hand partnership between the program and the state's technical college network. The agency's name is especially relevant today, says Commissioner Heidi Green. "Companies used to have six to nine months of pad time," she says. Today, "they're waiting longer to make that investment, so they're needing that investment to come online more quickly. Quick Start has the ability to get those workers up and trained and working that line or answering that phone as quickly as possible. Time and efficiency is so important right now to companies. We have the assets to make that happen." After the project announcement, when the cameras are turned off, is when Quick Start goes to work with the heavy lifting of process and organizational study. Quick Start staff go beyond rote functions to understand complex operations, such as cell cultures in the biotech arena, all in an effort to break things down into clear, teachable form. At Kia's training center at its new manufacturing and assembly complex in West Point, Ga., Quick Start's advanced manufacturing team developed a stair-step training strategy moving from theoretical fundamentals such as electrical concepts to specific operational details such as programming electrical devices, then programming the PLC's that control robotics. By integrating and structuring the training, Kia has thus been able to maximize the numbers of people being trained effectively and quickly. Kia Motors Manufacturing Georgia's senior vice president called Quick Start's training "the new global benchmark" for advanced automotive manufacturing. Quick Start has pursued similar process-based projects with Dendreon, a biotech company located in Union City just to the south of Atlanta; with longtime Georgia employer and floor covering manufacturer Shaw Industries at a plant recommissioning in Calhoun; and with Efacec, which is now assembling electric power transformers in Effingham County, north of Savannah, with the help of animation produced by Quick Start that breaks down the assembly process. The agency's training assistance in such areas as micro-welding also helped convince medical device maker Angiodynamics to bring more product lines to its plant in Manchester, south of Atlanta. And it's assisted NCR with wiring diagrams for its ATM plant in Columbus. Most importantly, Quick Start's support extends to small-town expansions as well as big-city blockbusters. Georgia's community and technical college system, working through Quick Start and the state's Work Ready program, simultaneously forges strong individual skills, strong communities and stronger performance from the companies smart enough to take advantage of what they have to offer. Across the board, the schools are seeing increased enrollment, reflecting a nationwide trend. And they are both consolidating and expanding to meet company and work-force demands, including a new $10.3-million transportation, logistics and manufacturing center at the Acworth campus of Chattahoochee Technical College (CTC) north of Atlanta. That school in particular saw a 17-percent rise in enrollment at its seven campuses in fall 2010, after undergoing a merger of three institutions in summer 2009. Its newest campus will open in early 2011 in Canton. Its most popular campus is in Marietta, near the operational base of Lockheed Martin. That's where the college recently renovated a former transmission shop adjacent to its campus to house a new intensive training course in aircraft structure for Lockheed. Successful students receive Manufacturing Skills Standards Council (MSSC) certifications in safety and quality. "We just graduated our first class from there, and only one did not get a job at Lockheed," says CTC spokesperson Rebecca Long of the new certification location. "We're now running two of those classes at the same time." Across town, Nick Masino counts Gwinnett Tech among the flagship technical colleges in the state, so popular in the midst of a popular suburban county that it had to turn away "6,000 people in the health sciences," he says. Meanwhile, it's not turning away growth in such areas as digital game development, data center professional certification (Atlanta has quietly become a data center hub) and photovoltaic solar manufacturing, which involved the school's close cooperation with Suniva, a solar company that located its headquarters in Gwinnett County's Technology Park in 2009. CTC, Gwinnett Tech and the state's other community and technical colleges serve as the gateway for the Georgia Work Ready program, which serves individuals, companies and communities with various skills certification programs based on the WorkKeys assessments developed by ACT, Inc. Sixteen new counties achieved the designation in September, not long after the agency launched Work Ready Connect, the state's new online employment marketplace. Dr. Randall "Randy" Peters, newly installed this fall as president of the newly consolidated Southern Crescent Technical College south of Atlanta, previously served as president of Heart of Georgia Technical College in Dublin. He says his former institution began by conducting Work Ready assessments of individuals, then branched out to companies. One, a lighting company in Cochran, immediately saw its employee turnover decline by a double-digit percentage. Then the Best Buy Southeast distribution center in Dublin found out about the program, says Peters, "and started very quckly thereafter using the Work Ready assessment not only as an employee selection tool, but as a consideration for employee promotions." Peters says Heart of Georgia also worked with Quick Start to help Best Buy, recreating at the school's conference center the rack system used in a Best Buy warehouse. "They knew how to make it work the day they opened the doors," he says. "You can't overestimate the impact on the bottom line for a company." Last but not least, says Peters, Parker Aerospace, which makes guidance assemblies for missiles in Dublin, has begun using the profiles. "Their plant manager, Phil Dowd, got so excited about what we were doing with Work Ready, he's now the chair of a steering committee at the technical college working on a career academy." The newest to locate in Dublin is German firm Mage Solar, which is investing $30 million and creating 350 jobs at its new North American headquarters and solar panel manufacturing operation. Peters says another still undecided international company has visited Dublin since, precisely because Mage has located there. While the Heart of Georgia region is focused on advanced manufacturing, Peters says his new institution's region may be pursuing a special focus on logistics. He says creating a Work Ready Region can be a catalyst. "It allows us to bringin similar industries around a table: As soon as those people start having lunch together, rubbing elbows, hearing briefings, a synergy starts to take place. Once those plant managers see the value, and the HR managers start seeing the savings, it pretty much grows itself." "We also offer a job profile, a job analysis system created by ACT as a counterpart to the assessments," says Chris Baucom, business development manager for the Governor's Office of Workforce Development. "We meet with job incumbents at companies, and learn how these foundational skills can apply to a specific job. This allows larger companies to use a content-validated pre-screening system for their employees. They love it." Debra Lyons, director of the Governor's Office of Workforce Development, says Georgia Work Ready has certified over 150,000 people in two years, or some 12 percent of the national total. It gives some 7,000 assessments a month. More than 540 companies are listed on the Georgia Work Ready Web site as preferring or requiring the certificate as part of their hiring process. "For the person who is Work Ready certified, we're giving them confidence," says Lyons. "We cannot build a skilled work force unless the people who are doing the work understand their skills, and relative to a job. That's the most powerful thing we are doing." Work Ready-savvy operations in Georgia are telling their home offices about it, simultaneously helping the firm consider similar changes in other locations, and helping that firm see its Georgia site as a clear leader. Work Ready has certainly done its work in Middle Georgia. The end of summer brought multiple projects to the Macon-Bibb County region, with announcements by aerospace parts maker Make Manufacturing, TIMCO Aviation Services (130 jobs) and First Quality (150 jobs, $200 million investment). The First Quality expansion will feature a new $35-million diaper manufacturing plant, as well as a new wave of high-tech equipment. "Their site here in Macon was the first Work Ready certified site in the state, back in 2000," says Pat Topping CEcD, senior vice president of the Macon Economic Development Commission. "The former plant manager had been transferred to a plant in Pennsylvania. He made the case that they needed to look at doing their expansion in Macon because of the work force. Without that support from him they would have been breaking ground in Pennsylvania." Topping says First Quality managers were able to demonstrate substantial savings to their bottom line as a result of Work Ready: Lower waste, higher productivity, and a shorter training cycle when they started new product lines or hired new people. "All of their employees were Work Ready certified," he says, but even when some had a gold-level certification, "they all wanted to get the next level. The work force was actively involved in trying to improve their skills." TIMCO has been no less pleased with the results it's seen. "We are proud of the quality of services our team has delivered at our Macon, Georgia, location for the past twelve years, and our decision to invest in widebody capability will position Macon as a viable source for commercial aircraft maintenance for many years to come," said Kevin Carter, who along with Ron Utecht shares the CEO office for TIMCO. Georgia ranks eighth among U.S. states for aviation industry employment, with more than 80,000 employees in more than 500 operations. The state's total aviation exports worldwide topped $3.4 billion in 2009. Located on the campus of the Middle Georgia Regional Airport, TIMCO's Macon complex includes two hangars, with capacity for three simultaneous lines of work. Not far away, Bombardier in January announced it would take over the ASA MRO operation and increase its payroll to 180 mechanics. Topping says the quality of service TIMCO was seeing from its Macon site allowed it to compete successfully against sites in Alabama and South America for this latest package of work. Behind the success lies a web of teamwork involving Quick Start, the Georgia Dept. of Labor, the Georgia Center of Innovation for Aerospace and the area's two tech schools, Central Georgia Technical College and Middle Georgia Technical College. As of the end of July, Topping says the Macon metro area had nearly 3,000 people who had been assessed in the Work Ready program, and he says the community is making a strong push to be Work Ready Certified. "Even in this tough economy, there are still skills and skill levels that people are having difficulty finding," says Topping. "Once we get further into the Work Ready program, it will help us quantify to prospects and existing industries what the work force looks like." Topping says Central Georgia Technical College has an enrollment of 11,000, one of the state's largest, and is bursting at the seams. Among its new programs is a hybrid vehicle manufacturing technician certification, conducted via the National Alternative Fuel Training Consortium. The area is also fortunate to have both Mercer University and Macon State University, both of which often accompany Topping's team when talking to prospective companies. "Yesterday we had the dean of the engineering school at Mercer with us to talk to a prospect," says Topping. "The company's project team was led by a VP of engineering, so they were able to talk the same language." July 2010 saw the beginning of 12 months of intensive executive leadership development for 380 executives selected by NCR. Its provision was just another part of Georgia's comprehensive incentive package. "We put together a program with Georgia State, the University of Georgia and Georgia Tech," says Economic Development Commissioner Heidi Green. "People think about the university system on the R&D side, but we went a step further on the leadership training. That's an area that most companies probably don't realize we can help them with." The 35-campus University System of Georgia (USG) has supported company projects since 1996 with a unique program called ICAPP (Intellectual Capital Partnership Program). Though it has seen its funding cut in recent years, with some projects now funded directly through the Governor's office, its investments have shown a handsome return. A 2003 report showed more than a 12-to-1 return for the state on ICAPP investments. From FY 2003 to FY 2008, ICAPP leveraged nearly $16 million in private investment. The program worked with NCR before, in 2002, when the company had a steady need to update its kiosk and POS software for clients. Through ICAPP, NCR donated that software to Georgia Southern University in Statesboro and Georgia Southwestern State University in Americus, so they could get the contracts with NCR or their clients to do the updating and customization work. "Students were getting great experience, they were being paid, and the school was getting revenue," says Terry Durden, assistant vice chancellor of the University System's Office of Economic Development. ICAPP was born in Columbus when credit card processor Total Systems (TSYS) needed to expand, and couldn't find colleges still teaching the Cobol computer language. Thanks in part to ICAPP, TSYS stayed in Columbus, and created thousands of jobs in the late 1990s. ICAPP jumped in again to assist another Columbus mainstay, Aflac, with IT needs. And its support for NCR in Columbus has gone beyond leadership training, with Georgia Tech faculty and students assisting with systems analysis and computer modeling and simulation for the plant's production line. The Columbus connection extends through Columbus State University, where a graduate certification program in computer modeling and simulation has been created in order to help meet the explosion of demand coming from the expanding Fort Benning and its cluster of contractors. In response to bioscience industry requests, ICAPP funded the creation of three graduate programs in regulatory science and clinical trials at the University of Georgia's College of Pharmacy. Since January 2006, 144 students from 33 Georgia companies and biomedical institutions (and four from out-of-state) have enrolled in one of the programs. And when General Electric decided to locate its smart grid research center in Atlanta, it provided $100,000 toward enhancing an existing professional master's in applied systems engineering at Georgia Tech, with a curriculum focused on smart grid technologies. At the state's request, ICAPP also contributed to the attraction of the $70-million, 300-job Dendreon biotech complex in Union City, providing a report on 14 different life sciences programs at eight Atlanta-area schools, and researching graduates across the USG in a number of relevant disciplines. Dendreon was just one of the 42 economic development projects that ICAPP worked in 2009. In October, the USG received the Governor's Customer Service Agency/Institution of the Year Award. The Augusta area receives a substantial economic benefit from the presence of the Medical College of Georgia (MCG) and Augusta State University. Together, these two institutions have a $1.2-billion economic impact on the Augusta economy and produce 11,176 jobs. That's a bit more substantial than the $110-million impact from the annual Masters Tournament. Life sciences is one of the area's target industries, in part because of the presence of MCG, 11 hospitals and two business incubators, says Walter Sprouse, executive director of the Development Authority of Augusta-Richmond County. Aviation, IT and data centers are other strong targets, as is the military (thanks to the presence of Fort Gordon). How strong is the available work force? As ADP continues to expand, says Sprouse, he was told that some 1,500 applicants applied for the most recent wave of 60 hires, which brought the ADP payroll in Augusta to approximately 700, on its way to 1,000 eventually. According to ADP, says Sprouse, about 1,000 of those applicants were qualified. "Augusta is totally surrounded by excellent sources of available workers, trained in a variety of technical professions," says Sprouse, citing the nuclear technology field that's so important to the Savannah River Site just across the river in South Carolina as well as the expanding nuclear power plant at Georgia Power's Plant Vogtle. "Plus we have the Hull School of Business at Augusta State University." Augusta Technical College plays a major role too, as it did in working with Quick Start in getting a new Teleperformance customer service facility up and running last year. "Seven months after we announced," says Sprouse, "I got a call from them and they said, 'Walter, we want you to know we're going to hire about another 200 people.' " The firm also said it was considering closing another facility and moving the work to Augusta, Sprouse says, because of the superior work force. Work force quality and the lower cost of living (housing is 38 percent of the national average) also helped Kellogg decided to expand the former Keebler plant in Augusta for the second time in four years, this time with a $30-million, 225-job investment. "It's one of the most efficient plants in their entire system," says Sprouse. Sprouse says that out of all the technical colleges in the state, Augusta's is the third largest. "However, they graduate more people than anybody. That one fact means a lot. It means the people going through the technical college system in Richmond County stick with it, have that drive, and want to finish their degree. "I tell that to industrial prospects all the time," he says, "and you see their eyes light up." The eyes of talented Georgians are lighting up too, thanks to the state's growing network of global connections. "The most exciting thing about Georgia's prominence on the international stage is the ability for our homegrown talent to stay here, close to family, and have the same opportunities that are available anywhere," says Gov. Perdue. "The economic downturn notwithstanding, we are working hard to ensure we have those opportunities for our citizens to thrive. If they do well, so will we." This Investment Profile of Georgia was prepared under the auspices of the Georgia Department of Economic Development. For more information, visit www.georgia.org. Mitsubishi Power Systems Americas welders participate in a Quick Start training class in Richmond Hill, Ga., near the site in Pooler where the company is constructing a new manufacturing facility. FACT: A spot check of weekly earnings by production employees on manufacturing payrolls found an hourly rate of $648.52 in June 2010, 15th lowest in the country. Overall, <?xml:namespace prefix = st1 />Georgia wage and salary workers paid hourly rates had median hourly earnings of $12.13 in 2009; nationally, the median was $12.44. For manufacturing companies, this presents more business opportunities. <?xml:namespace prefix = st1 />FACT: Georgia is home to 54 public and private universities and 34 technical and community colleges. mong the most recent forecasts by the Martin Prosperity Institute, headed by "Rise of the Creative Class" author Richard Florida at the University of Toronto's Rotman School of Management, is the growth in density of the creative class in the coming decade, with the creative class defined as "people employed in science and engineering, business and management, health care and law, and arts, culture, design, media, and entertainment." As the map above shows, Greater Atlanta will be among the national leaders in attraction and retention of such talent, predicts Florida's team, outgaining such cities as Boston, Dallas and Philadelphia. According to <?xml:namespace prefix = st1 />Florida, creative class jobs, which already comprise roughly one-third of total employment and more than half of wages and salaries, will represent half of all projected U.S. employment growth in the coming years, "adding 6.8 million new jobs by 2018." "Technology does not self-replicate — it takes skilled and talented people," said Dr. Kevin Stolarick, research director for the Martin Prosperity Institute, during a recent speech to Canadian economic developers. What's more, he said, creative-class workers, almost by definition, do not face unemployment in the same way as blue-collar and service-sector workers do. "Having lots of these people in your region is probably a pretty stabilizing influence," he said, pointing to data that indicate a rise in earnings accompanies increases in a work force's analytical and social intelligence skills. In an interview, Stolarick points out several notable attributes of Atlanta. Among them, "it is home to a significant number of college-educated African-Americans. And educated people attract educated people." He says there are more than 800,000 creative-class workers in the Atlanta metro area, making an average wage of more than $72,000. Such a critical mass of whole-brained people exerts a magnetic pull for even more talent, even when the economy is down overall. Analysis of moving data across a large cross-section of moving companies by Movers.com found that Atlanta had the third-most move-ins of all U.S. cities during the second quarter of 2010. "NCR was in Dayton for 125 years. The No. 1 reason they moved was because of talent," says Gwinnett County's Nick Masino. "There are tons of highly educated people in Dayton. Ohio has a very high percentage of people with a four-year degree. The problem was people wouldn't move to Dayton … Not only did we have the talent they needed now, but they could get anybody they need to move to Atlanta. And there's a lower cost of living." What's more, says Masino, NCR had to find jobs for spouses too. "We helped dozens of spouses find jobs," he says. "Cisco uses the program now too. We called it Georgia Pathways because we fully intend to share it with everyone. If you look at NCR or Suniva, they were attracted by state tax incentives, local personal and real property tax abatements, then Quick Start, and then programs at the local level like Georgia Pathways. It's not a silver bullet — we package and layer these opportunities." ort Gordon is not just the Army's training center, but all the military's training center for IT," says Walter Sprouse, executive director of the Development Authority of Augusta-Richmond County, also noting the base's core expertise in veterinary medicine. "On average there are about 130 people per month who rotate out of <?xml:namespace prefix = st1 />Fort Gordon. Of that number, about half of them go home, and about half of them stay because there are employment opportunities here." That, in a nutshell, is why Georgia's military installations are a key element of the state's work-force infrastructure. "One of the things we consistently hear from employers is that they love to hire people coming out of the military," says Heidi Green, Georgia's commissioner of economic development. That affinity for former military (and for military spouses as well) has been a strong tool for the Columbus area owing to the expanded mission at Fort Benning. As part of becoming the Army's Maneuver Center of Excellence (MCOE), Fort Benning will welcome $3.5 billion in investment; 30,000 more people; 4,000 new houses and 900 replaced hotel rooms. MCOE spokesperson Bridgett Siter told Site Selection the influx amounted to a trickle as of late 2009, but "about the time school lets out in 2011, that's when you're going to start seeing the population flood." FACT: Georgia's HOPE (Helping Outstanding Pupils Educationally) Scholarship program, created in 1993 and funded by Georgia's lottery, rewards in-state students who maintain a "B" grade average with full tuition, approved mandatory fees (such as health and student activity fees), and a $150 per semester book allowance for study at any of the state's public higher education institutions. At private colleges, the HOPE Scholarship provides $4,664 per academic year. "I was with a company in Texas, we had an hour, and we got to the HOPE slide," recounts Georgia Economic Development Commissioner Heidi Green. "For the next 30 minutes, we answered questions about the HOPE Scholarship. The company was floored by this concept. It is a real asset to this state. We don't lose our best and brightest. They stay here, and we get the opportunity to put them in our work force." he spreading International Baccalaureate school movement, which emphasizes "world-mindedness," a positive, high-quality education, foreign language mastery and community service, got its start in 1968 because of demand from corporate executives abroad. Today, says IB spokesperson Sandra Coyle, "We're hearing from more corporations and companies that they're looking for more of those skills students acquire through IB." The IB network now counts 3,070 schools in its rapidly growing roster, including 1,199 in the <?xml:namespace prefix = st1 />United States and 58 in Georgia, placing the state at No. 7 in the nation. ince the 2004-2005 school year, Georgia has seen a 97-percent increase in students scoring a 3, 4 or 5 on Advanced Placement exams, compared to a 52-percent increase nationwide. The six-year trend also shows Georgia has experienced a 106 percent increase in the number of AP public school test-takers, compared to a 56-percent increase nationwide.